A diy that didnt last! A diy that just didnt last! I painted my kitchen chairs to try and give them a new lease of life, they looked good for a while but now they have gone to basement heaven! They ended up looking quite scruffy with chips, scuffs and showed up all the dirt from my busy kitchen. a bad kind of shabby chic. Not sure if painted furniture in the kitchen is the way to go! 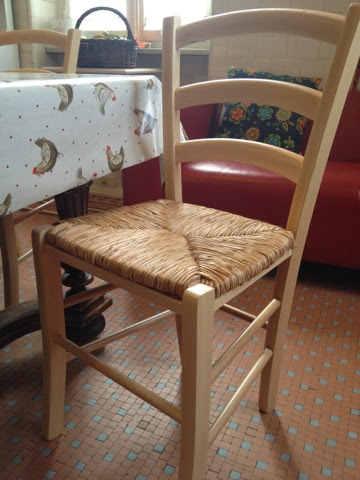 I have now kind of given up and bought some new cheap chairs to grace my kitchen. Not very exciting but maybe they will last a bit longer and look better for longer! Like my chicken table cloth?! This entry was posted in Uncategorized on February 4, 2014 by louise.